The Nike LeBron 9 “Watch The Throne” was gifted to both Kanye West and Jay-Z to celebrate their tour and the release of their joint album, Watch The Throne. For 2019 NBA All-Star Weekend, the “Watch The Throne” theme will be returning on the Nike LeBron 16 dressed in a Black, Metallic Gold, and Rose Frost color scheme. Much like the LeBron 9, the LeBron 16 Low features a Black upper with Gold Swoosh logos highlighted with the WTT-themed laces and inner lining. An icy translucent outsole and the classic WTT lace lock completes the design. Look for the Nike LeBron 16 “Watch The Throne” to become available possibly as a #LeBronWatch release during All-Star Weekend. A tentative date is set for February 17th. The retail price tag is set at $200 USD. 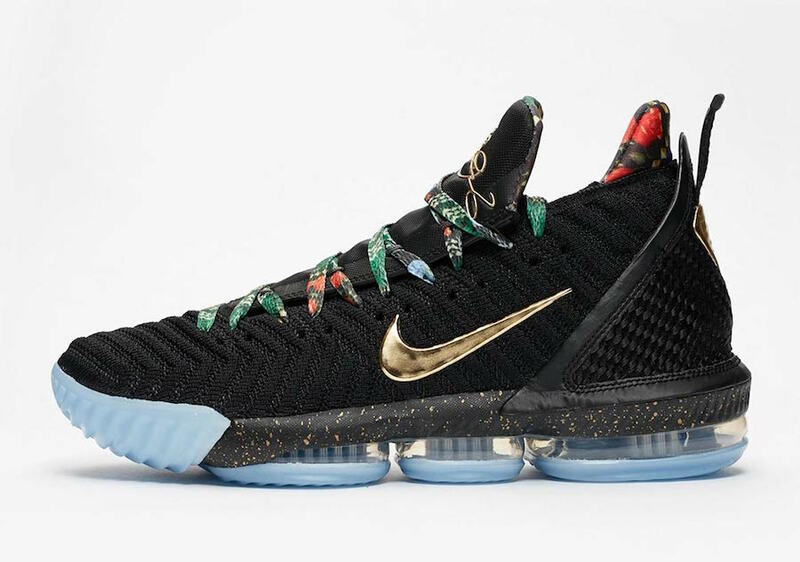 UPDATE: In time for tip-off of the 2019 NBA All-Star Game, the “Watch The Throne” LeBron 16 is available via Nike SNKRS Draw. UPDATE: In addition to the “Watch The Throne” LeBron 16 releasing through the Nike SNKRS App via the LeBron Watch campaign, select retailers such as SNS will have stock as well. UPDATE: Much like the LeBron 9, the “Watch The Throne” LeBron 16 will include the classic lace lock. Additional photos via Complex. UPDATE: Here is the first look at the “Watch The Throne” Nike LeBron 16 via J23app.